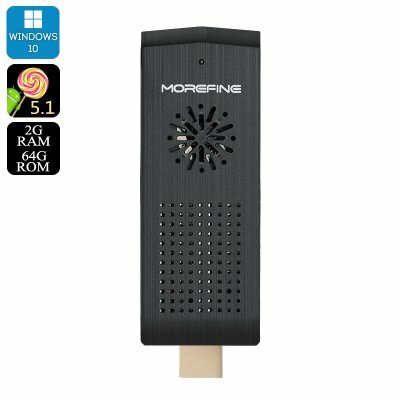 Successfully Added MoreFine M1+ Plus HDMI Dongle - Windows 10 + Android 5.1, Intel x5-Z8300 CPU, 2GB RAM, 128GB Micro SD Slot, Wi-Fi, BT4.0 to your Shopping Cart. The MoreFine M1+ Plus is the latest finger PC and comes with an Android 5.1 operating systems as well as a trial version of Windows 10 so you have dual boot capabilities and two operating systems in your pocket. Like its predecessors the M1+ Plus comes with an Intel Quad core CPU that features burst technology allow it to crank up the processing power when you need. So should the going get tough, this mini PC can step up to the challenge with its superb performance. Burst technology is also exceptionally power efficient and will only uses the cores required, keeping them ready and on standby when not needed, this enables the mini PC to quickly jump into top gear when you need that extra processing grunt but save energy when only doing light tasks. A trail version of the Windows 10 OS is installed on this mini PC along with a full Android 5.1 operating system. This puts two competent systems on one ultra mini PC so you have greater versatility on this one minicomputer. So whether it's for work or play the MoreFine M1+ Plus is the perfect tool you need for turning any HDMI display, TV or projector into a powerful min computer for watching movies playing games or presenting your ideas to the board. Simple connect to the HDMI port, power it on and in seconds your pocket PC is ready for action. This M1+ Plus Dual Boot Windows 10 and Android 5.1 PC dongle comes with 12 months warranty, brought to you by the leader in electronic devices as well as wholesale PC and TV Dongles..